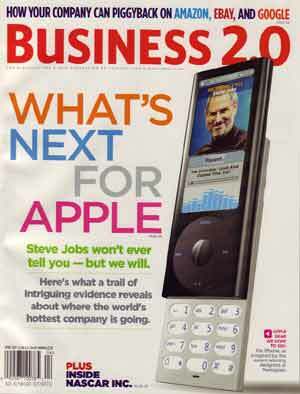 There's an article on the cover of Business 2.0 magazine about what new product are coming from Apple. The article is fictional, however. The author is just guessing at what things Apple could put out. There's no "big scoop". So don't bother buying the magazine. You can read this article online for free anyways. But I can't think of any other company that gets this kind of coverage. I don't see articles about the next big thing from Proctor and Gamble, General Electric, or Ford. But people are constantly looking with bated breath at whatever product comes from Apple. This used to only apply to Macheads, but now it's spreading to mere mortals. Macheads have long known how great Apple products have been. The iPod introduced to the world what the Macheads had known all along. Apple products are so wonderfully designed that there hasn't been a single dud in the last 8 years. Only one product has been discontinued - the Power Mac G4 Cube. And this isn't a product that was a dud - it was just mis-priced. It's still a product of wonderful design. This is what attracts people to Apple products. People want to see exciting, perfect products, and only Apple delivers.